Fitting flow bench adapter to racing head. 3.0l, big bore, stock stroke, roller cam, tri-ported and angle port exhaust heads, IR intake, custom equal length headers, SDS EFI fuel and ignition management. This engine will easily rev to 7200 rpm and will have good torque from 2000rpm. 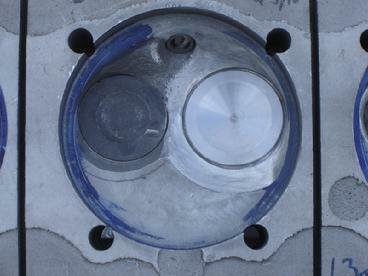 Intake port flow numbers are critical. This 3.0l engine needs 220+ CFM flow for the intake ports. I'll be flowing a new set of ultra performance heads later in the year. With the target CFM plugged into the engine software program this engine will produce 348HP at 7000 RPM. I'll post progress reports as things proceed. The racing heads are coming along nicely. Fabricating the IR intakes now. The exhaust have been cut for angle ports and just need the tubes built. Valve sizes are set and once the intake runners and exhaust tubes are installed the head will go on the flow bench and get ported. 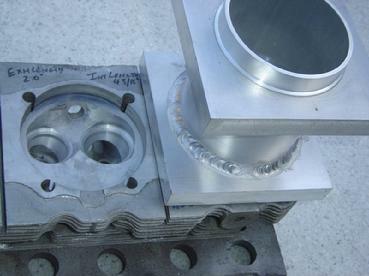 Image on left is a racing head with the flow bench adapter being fitted. Still need to drill and tap holes to hold the head to the adapter. 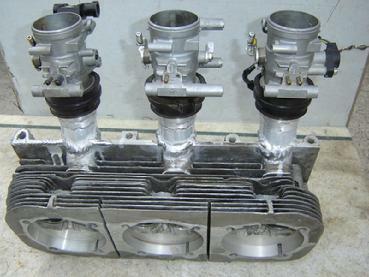 The adapter is designed to be reversable: 1 side accepts a stock '65 to '69 head while the other end will fit a head cut for 92 - 94MM big bore cylinders. You can see on this head the valve seats were cut directly into the aluminum for porting. Proper seats will be installed after porting is complete. Just completed flow bench, good to 420 CFM. First head to test is my race head. Flow bench is from Flow Performance. This is a really nice unit, more than enough flow capacity for the Corvair head; no matter how much power we need to make. I have my 110 race head sitting on the adapter. I still need to start porting the intake and exhaust ports on the center cylinder. I'll be posting the results as I get them. I'll also be testing stock 110 and 140 heads and compare them with my "big valve" 110 heads. Here is the racing 110 head on the flow bench. I have 5 days worth of grinding and testing on 1 intake port. I am getting very close to the end. I am trying to gain 1 CFM at a time and they are getting very difficult to aquire. This is an early test 5 days ago. CFM data is the 3rd column. Each MARK is .1" lift. The head has 1.72" intakes w/ a 1.5" seat ID. The exhaust has 1.5" valves w/ a 1.3" seat ID. No testing on exhaust yet. The port started at 150 CFM at .6" valve lift. 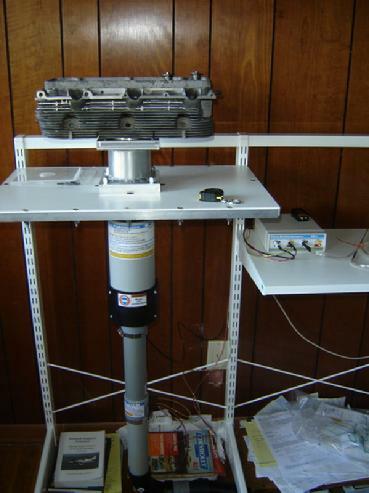 Note: All testing on my flow bench is based on 28" H2O standard. Another test on the 24th. And on the 25th. I started editing the data. I added a longer clay extension thinking I had a problem w/ the short clay at the port entry. No change between the short or long clay. Very interesting. On the 26th. Not getting anywhere. On the 27th. Decided my low flow was caused by crap in the "bowl" area. Started blending at the guide boss. I have many more data table than shown here. Now we're getting somewhere. Guide boss has a lot of blending now. And now yesterdays data. I think I am at the end. Slight grinding seems to go nowhere or slightly reverse. 192 CFM on a 110 intake - not a bad days work. The exhaust will be next but first I need to add the angle port tubing and flange. Well, I've been looking at other websites that have flow data and I am concerned about the mid-flow numbers on these race heads. I think they need improvement. The flow at .6" lift is comparing favorably to other heads with the same sized intake valves at this lift. But the flow at .3" and .4" is too low. I think the main problem is in the combustion chambers; too much valve shrouding. Once I get a little time I will cut back the area between the valve and quench in small stages and recheck flow. Maybe in a week or so. I spent 4 hours yesterday working on the racing head trying to get the mid-lift flow numbers higher. I did no grinding in the port; all work was done in the combustion chamber. The Corvair head has a Lot of valve shrouding which kills flow. I performed 7 tests on the flow bench and initially the numbers seemed stuck. So I started to lay back the chamber walls both near the spark plug and at the quench. Both areas helped. 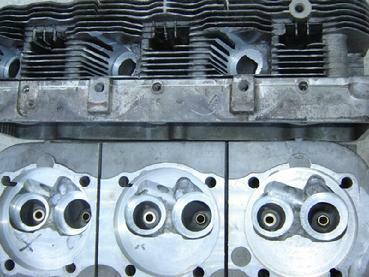 Remember these heads started out as 1962 102 HP heads and they have extra material around the spark plug hole. I guess to raise the compression ratio. But with the 140 intake valve the chamber walls were getting really close. So here is the latest flow data. Gained 11.4 CFM at .4" lift. I like this. I cut back the quench area 1/4" further and this seemed to make the most benefit. I am still trying to get the flow at .6" lift above 200. Time will tell. A look down the intake runner early in the porting sessions. 110 intake very near the end of porting. 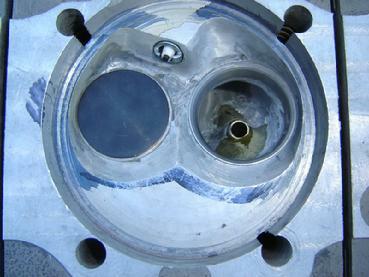 Chamber wall right of spark plug and quench area nearest intake valve cut back to improve mid-lift flow. I decided to add angle plugs to the race head. This one is finished. 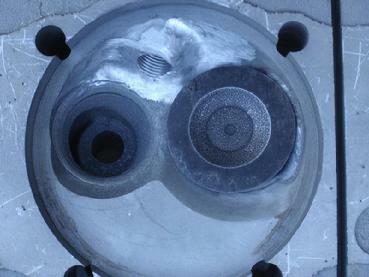 Here is the same head and chamber as above. I decided to add angle plugs. This will help with both detonation reduction and ignition timing. I'll need to see how much total timing reduction I can use at the engine's maximum torque. I'll post info once the engine is running and tuning is set. I haven't decided which plugs to use but am leaning toward NGK. These are 3/4" reach. I'll post the NGK number soon. Here is the NGK plug number - BKR6EKUB or the short number - 7969. This a #6 heat range plug and should be good to start and tune with. Depending on how the engine responds I might need to use a colder plug. A #7 is colder but the plug will have a slightly different number and a different application. I should be able to get this head back on the flow bench soon. Just need to re-cut the seats with my new 3D seat cutting fixtures. I'll be trying a new radiused cutter to see if I have gained any more CFM. I still need over 200 CFM. Trial fit of TB adapters and attaching tubes. Nothing welded yet. Here is a quick update. I decided through testing and detailed measurements that the Hayabusa TB's will not work on the race engine. They are actually too small. So I decided to fit them onto the 65 Vert. They will fit great. Here is a pic of the adapters set on the heads with 1 TB attached. I am welding the TB adapters to the attachment pieces now. Then the assembly will get welded to the head. I need to blend the ports first. It's been a while since I posted an update even though a lot has happened here in the shop. The Vert heads did not work out as planned. When I heated the heads for guide removal an amazing thing happened. 2 exhaust seats fell out of one head and 2 intake seats fell out of the other. So I decided to increase the valve size since this engine will have the 92MM p&c's. I'll be running a stock sized 140 intake with a 1.48" custom exhaust valve. I cleaned up both heads, removed all ferrous metal, welded where needed and send them off for heat treatment. They returned within 2 weeks and look great. Just a little grayer in color. I have milled the chambers and now need to machine for the slant tubes. I should have this operation finished in a week. Then install the guides and cut the new seat counterbores. Finally install the seats and finish the porting w/ a radius type valve job. I won't have any flow data until all this gets completed. Left is a picture of the 110 heads for my 65 Vert. I finally had time to cut them for the angle port exhaust. You can also see the chambers and the modifications. I will be installing seats soon. Once the seats are in I'll weld on the throttle body adapters then spend quite a bit of time cleaning and smoothing the chambers and ports. The flow bench will come near the end of all this work. I'll post data as I have it. Fan side view of TB's on adapters. I finally found a bit of time to work on my stuff. I machined the openings for the angle port tubes, installed the new bigger seats and welded the throttle body adapters to each intake port opening. I still need to weld inside the port at the weld junction. But I am waiting for UPS to deliver my new TIG torch which will fit in the port opening. I need this torch for another job on some race heads so now I can get 2 birds with one stone. The TB's are not in the correct order but are the ones I will use. I'll need to fabricate the linkage pieces to tie each TB to the next. And build an air filter housing to cover the velocity stacks. In due time. The valve job will be next along with chamber and port clean-up. Then on to the flow bench to check and set flow. I have the aluminum rod I will use for the new TB spacers. My son and I took the measurements and today I will turn these on the lathe. I still need to make extensions for the linkage and silver solder them onto the stock throttle levers. These will connect each TB to the next TB so all will open together. I'll also make the longer fuel tubes for this set-up. 3 months of work on a pair of race heads is finally finished. So now I'll have some time now and then to work on the race heads. 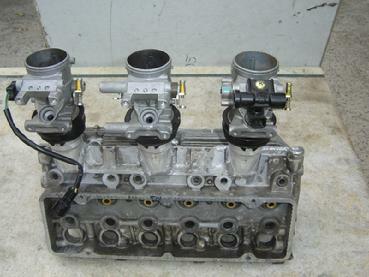 I'll start with the valve job so I can get the heads on the flow bench. I need to have a start point on the flow numbers. I'm not sure where that will be. Maybe that will happen this Labor Day weekend. I also had the angle port tubes bent to the 18 degree angle I need. So the pipes are ready to cut and fit to the heads. But, I'll open the exhaust port to match the pipes first, fit a straight section temporarily and flow the exhaust ports. Again for a starting point. Outside view of TB's on adapters. 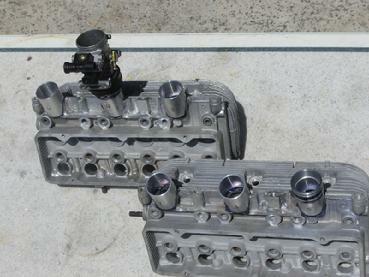 These Hayabusa heads will go on the race engine, not the Vert. I found some time to get a chamber close to finished on one head then cut the seats. I have been wanting to get these on the flow bench to see where they flow. So far, so good. On the left are the data I recorded this afternoon. Knocking on 200 CFM with the max velocity I have seen of 385 FPS. I played around with some clay at the guide boss where I found turbulence. I got 4 to 5 CFM at this point. I need to make a silicone mold of the port to get a better visual and to measure the CSA at several points. Then I'll have a better idea of whether I need to cut or fill. 2 - the port itself is size restricted. Once I have accurate CSA measurements I'll see where the restriction is. I have an idea but don't want to cut without a solid plan. Left is a picture of a completed chamber. You can see the work at the guide boss and the epoxy I added to smooth the beginning and end of the boss. This port is now flowing 212 CFM but I have seen the CFM up to 224 while testing the port with a flow ball. I need to figure out what to do to get the flow to this point. The most recent grinding and flow testing from this morning at the left. I made the silicone molds and calculated the CSA's. I can see where the port is going sonic and where I need to remove material. So it is working just fine. I used up the mold material and ordered some more. I want to make a second mold to see the progress. Hitting 207 is very pleasing. I'll still try to make it over 220. Thanksgiving is getting close. I hope you all have a very nice time with your families. Still working on the intake port. I shortened the guide by .250" and blended the guide boss. I am picking up a bit of turbulence on the port side approaching the shorter bias. I need to open this a bit and raise the short bias some. The current shape is very nice and flows over 220 CFM. When I hold the 3/8" flow ball in a specific point I can get the CFM to jump to 233. This is due to the combustion chamber. The spark plug boss is hurting flow into the chamber and I don't think I will alter this as it would entail welding and since the seats are installed I don't want to compromise them. Compromises. The latest numbers are at the left. Here are the first of several silicone molds I made. Top is a stock 110 intake port. Next is the intake port from my 110 Hayabusa race head. And last is a stock 140 intake. The increased length on the race intake is due to the adapter I welded onto the head. I did run my engine specs in PipeMax which calculates out how long the intake runner needs to be and this longer intake will provide the necessary tuning effect. I have been wondering what was causing the CFM to jump when I placed a flow ball in the "special spot" in the port. I had thought it was all due to the spark plug boss in the chamber protruding toward the intake and causing a flow problem as the air enters the chamber. A good friend suggested I use a 1/2" reach plug and shorted the boss. Duh... Sometimes you cannot see the forest because of the trees. So... I ground back the boss to the shorter plug location and smoothed up the chamber. The flow jumped to 224 right away. Great. But the flow ball still causes the CFM to jump. Now what? Another test... I added high temp epoxy in the intake at the SSR to build it up just a bit. It cured over night so this morning I started sanding. Many times and tested in between each. At left is the latest flow numbers. And now when I hold the flow ball in the "special spot" nothing happens - except the flow drops off a bit. So the problem may have been 2 fold. The spark plug boss and the SSR. The only way to tell is on the next port I will add the epoxy to the SSR first and check. If the flow ball causes a jump then the plug boss is part of it but if the CFM does not jump then it was only the SSR. I really can't do anything different since the heads can't be welded to bring the plug boss back out. I am stuck with the 1/2" reach plugs. But I am really pleased with the numbers.